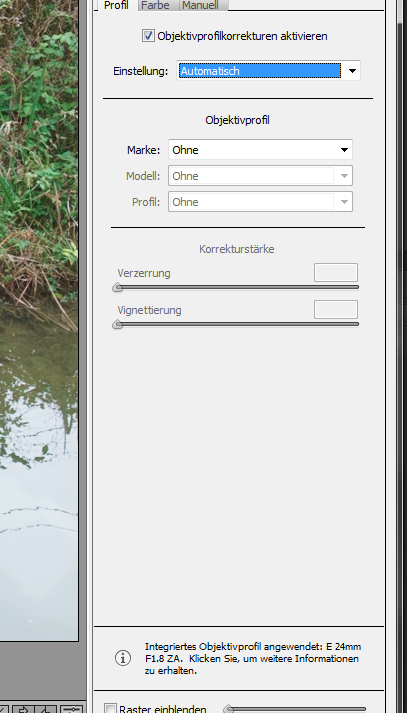 LIGHTROOM Develop mode doesn't recognize the Sony E 24mm F1.8 in "auto" mode. I always have to set it manually. Oddly, RAW metadata is displayed correctly but the lens correction module refuses to automatically set the Sony E-Mount 24mm F1.8 (Carl Zeiss) lens. The workaround is to load a brand new raw image taken with this lens, choose the right lens and notice that Setup switched from Auto to Custom. With the correct lens specified, click on Setup and choose Save New Lens Profile Defaults. Now set the Setup to Default and click Alt then choose Set Default... down below and choose Update to Current Settings. This will set the Default instead of Auto as the default lens profile Setup mode. It is important to have a new image and only have changed the lens profile Setup to Default before saving the new LR defaults. Actually I don't want a workaround, I want a fix. Unfortunately it's quite hard to report bugs to adobe, you always end up in one or another web forum. I do use several lenses and I don't want to move away from auto for that very reason. It's just one lens that isn't recognized correctly. The official standards for recording lens information in the metadata are only just starting to come into effect, and therefore it isn’t always clear which lens was used. Lightroom uses all of the information available to make an educated guess, but if it’s not sure it leaves you to select the profile. Once you’ve chosen the lens, you can set that as a default for that camera/lens combination using Save New Lens Profile Default so you don’t have to select it on every photo in future. That's why that option was put there. The Default setting in that pop-up does the same as Auto, but it allows you to override the settings for specific lenses, so it's the best choice most of the time. I would be worth providing a link to a raw file that doesn't work, so Adobe can look at it. Upload to http://www.dropbox.com/ and post a public download/share link to it. I tested images we shot with the Sony E 24mm F1.8 and profile auto-select worked in LR 5.6. Please post a sample as Steve suggests and I'll take a look. Sorry Chris but I've got to ask this. Are all reports ending up like this? I really wished Adobe would have kept a simple bug report form so that useful conversation can happen in private. Assuming this didn't just change with the ACR 8.7 Release Candidate for Photoshop, my analysis is that everything is ok and it is normal that a selectable lens profile doesn't get used when Auto is selected, and if you manually select a profile then you're getting double correction. I hope LR gets a UI update to show that built-in profiles are being used. @Steve: So as a workaround, I did as you said. Used "Save New Lens Profile Defaults". You should reset those profile defaults. You should NOT be selecting a lens profile manually because LR is already applying a lens profile automatically and this cannot be turned off. This is how mirrorless cameras work, nowadays, there is a built-in profile that duplicates what the camera is doing for its own JPGs. The Sony E 24mm f/1.8 selectable profile is for cameras that don't have this built-in correction, usually older cameras. Mine looks the same except in English. There is a built-in profile being applied in both ACR and LR so you should NOT be selecting a profile, yourself, manually. This is getting ridiculous, really. Trying to get some forum points? Sorry, I coulnd't resist. I am well aware of that stuff, believe me. I just told you that I utilized the workaround you proposed. I didn't say I was using that before posting this bug report. This is not a beginners forum. I reported a bug. As a Senior Software Developer, I care for a real fix provided by a developer. I don't care for a workaround provided by a mere user. I guess Chriss got his test case and now needs some time get it fixed. So thanks and don't further dilute this conversation. There is no bug. My workaround was for if there was and that wasn't obvious until you posted your raw file. Lightroom is operating as intended by not selecting a profile when you choose Auto. There is a built-in profile being used. You can do whatever you want, obviously, but with my workaround in effect, you are double-correcting the geometric distortion. If you click on the message in ACR, it says "this raw file contains a built in profile for chromatic aberration" (but not for distortion). So Steve is correct that a built in profile is being applied, however the separate profile is required for any distortion correction. So then the question is, does the camera, itself, correct geometric distortion or not? If not and Adobe is attempting to replicate the camera's lens corrections then maybe everything is still operating as intended and it is up to the user to correct additional distortion by selecting their own lens profile default. Lightroom ships with a distortion profile for it, so without seeing an in-camera JPEG, I would assume that this camera does NOT correct geometric distortion and everything's operating as intended, apart from Lightroom not selecting that profile when you check Enable Profile Corrections. Guys, you're testing my patience here. It doesn't bring me nor you nor this report any benefit if you go wild on assumptions. I was very clear in my bug report and it seems like the developer (the only persons that matters here) got it right. But to stop your puzzlement, the camera of course does geometric distortion correction by itself (when shooting JPEGs, obviously). LR (and thus CR) does _NOT_ apply the geometric distortion profile it ships for that very lens. But WHEN I manually select the distortion correction profile in Develop mode, LR applies it and eveything looks correct. The result is almost identical to what the camera creates. But that is totally not the point. The (and I really have to try hard to not start cursing here) point is that Lr does not do it automatically in that case. For other Sony E lenses I own, the distortion correction profile is correctly chosen and applied by Lr. Apologies for testing your patience, but you don't have to continue reading, let alone replying. Steve and I are having a conversation on this public forum about this topic, but we're not pestering you about it. It's always good to learn additional details about the behavior of specific cameras, and it'll benefit others searching for the information in future. Thank you for clarifying the in-camera behavior. Can you post a raw file from one of the lenses that does work how you expect in LR? What you've reported, so far, is that LR seems inconsistent in applying a Sony E lens profile automatically, and your assumption seems to be that because it does not apply a profile automatically for this lens, then there is a bug. As far as a general case of Adobe automatically choosing a selectable lens profile when there is also a built-in profile, the normal case would be that the corrections overlap and both cannot be applied. Specifically, any geometric corrections in a built-in-always-on profile would invalidate any vignetting and geometric corrections in a selectable profile, if both sets of corrections from different sources were applied. There was a specific case of this problem within the last year, where the built-in corrections did vignetting and CA correction and the selectable profile corrections were for vignetting and geometric distortion, and with both the built-in profile and the selectable profile were used vignetting was double-corrected, so a choice had to be made by the user whether to double-correct vignetting or not correct geometric distortion. In this specific case of this one lens, it would appear that we don't have clashing corrections, because only CA is begin corrected by the profile and presumably geometric and vignetting corrections could come from a separate profile and the application of both profiles sequencing of the two would be ok. It would be interesting to know what built-in corrections are occurring, if any, for the lenses that do have selectable corrections automatically being applied. After looking at the sample image, there may be a bug in the original profile. I'm sorting it out now and will follow up when I know more. Bug is fixed and will be available in the final ACR 8.7 and accompanying Lightroom releases.